Shunky VSI Crusher (Sand-Making Machine) is one of the most advanced sand-making equipments in the world and is further improved after introducing German Bamaque technology. 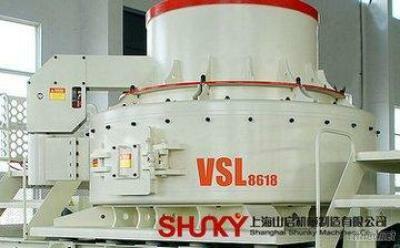 Shunky VSI Crusher is especially suitable for sand making and stone reshaping and is generally used in third crushing. It is a perfect combination of unique rotor structure design, wear-resisting technology, crushing speed optimization and hydraulic design. It provides high quality aggregate for highway, high-speed railway, high buildings, municipal construction, hydroelectric dam construction and mixing station.